Due to the lag (often more than 3 months) of Australian real estate price data market commentators frequently reference auction clearance rates for insight into how the market is currently performing. While auction clearance rates are generally a good indicator of price movements (see below) market observers should be aware of their limitations. 1. Auctions only represent a small part of the market. As RP Data has showed Melbourne and Sydney don’t mind auctions however the rest of the country overwhelmingly prefer private treaty campaigns. While the proportion of homes sold at auction is slowly increasing (8.3% in 1Q 2008 to 14.3% in 1Q 2013) it still represents a small proportion of the overall transactions as a method of sale. On average in 2012 there were 1,334 auctions per week. This had increased to 1,445 auctions per week by mid 2013. Obviously as auction clearance rates improve (as has occurred lately) vendors will be more likely to adopt this method of sale. 2. 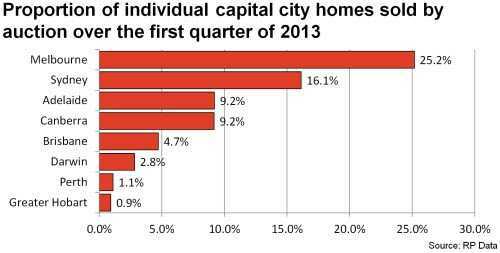 Skewed to higher value, inner city houses. In Sydney and Melbourne the median auction price is between $750k-$900k, well above their median property prices. Auctioned properties are also usually located within 12 kms of the city centre and are twice as likely to be a house than a unit (70% were houses for week ending 1 Sept 2013 in both Sydney and Melbourne). Clearance rates therefore are a closer reflection on the demand for these types of properties. Any macro analysis is usually limited as property trends can be very localised. Clearance rates are no different. For example it is not uncommon for clearance rates in south west Sydney to be 20% below those in the Eastern Suburbs. 3. Definitional issues. Selling at auction has different meanings. The following all count as a sale in the auction clearance rate calculation – sold prior to auction, sold at auction and sold after auction. It is not uncommon for 30% of properties ‘sold at auction’ to have actually been sold prior to auction. Far fewer properties are sold after auction. As there are different motivations and reasons for selling at different stages of an auction campaign the composition of the properties sold at auction can vary significantly without this being reflected in the overarching percentage clearance rate. 3. Selective reporting. Agents can be selective with the provision of data. As the information is source by data providers from the agents directly, agents can be selective with what they report. There is nothing to stop agents reporting weekends when clearance rates are high but not to bother when clearance rates at around 50%. Due to the above factors interpreting auction clearance rates should generally be limited to understanding their broad movements. 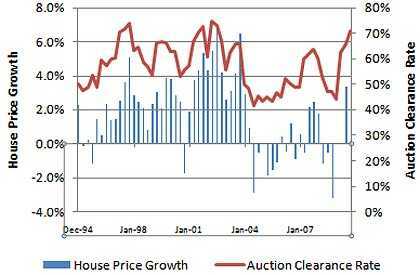 Given the time lag in the availability of sales price data auction clearance rates do assist market observers understand the current market (note for forward looking indicators refer to the Key Drivers section of our Australian Property Market Dashboard). We have devised the following broad rule of thumb for quickly interpreting auction clearance rates. The following ranges should be used only as a rough guide and the trends are just (if not more) important than just referencing the clearance rates in isolation.